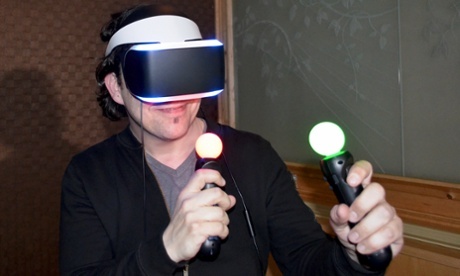 After 30 years in the geek wilderness, virtual reality entertainment is suddenly being taken extremely seriously. In March, the independent manufacturer of a forthcoming VR gaming headset, the Oculus Rift, was bought by Facebook for $2bn. Later that month, Brendan Iribe, the Oculus CEO, claimed that the two companies would one day build an online multiplayer virtual reality game for one billion players. A few years ago, that would have been insanely hubristic. Now? Probably not. 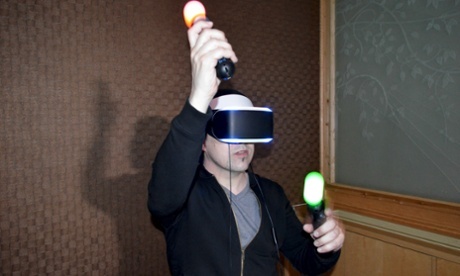 Crucially, Oculus Rift isn’t the only one fighting for the future of virtual reality. Sony’s got its own add-on VR headset for the PlayStation 4 called Project Morpheus, and even though it is still in development, it is a convincing look at the future of gaming, virtual tourism and a whole new set of experiences. Right now, Sony is actively researching what is possible, what works and what doesn’t in this new world of immersive entertainment. Lots of things are currently up in the air: such as how it will be used in the home, how it will fit into Sony’s greater consumer electronics lineup and when users will actually be able to get their hands on one. What is certain is that carbon-copying traditional 2D games and slapping them on a face-mounted 3D screen is not going to work. Convincing virtual reality – a big leap ahead of what was available the last time VR raised its head in the 1980s – holds a lot of potential for new ways of interacting, playing and experiencing content; not just games. 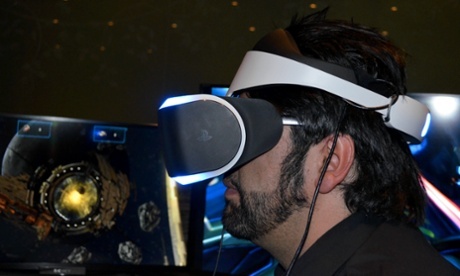 The Morpheus headset resembles most other head-mounted displays. Two screens are suspended in front of your eyes while a headband makes sure the whole thing doesn’t move. The current design allows users to add their own headphones, which strangely plug into the headset in a socket in the goggles, something Ashforth assured me wouldn’t be the case in the finished product. One cable connects the Morpheus headset to a processing unit that hooks up to the PlayStation 4. The processing unit is needed to handle some of the computational duties the dual-screen headset demands, leaving as much of the processing power of the PS4 available for the game or experience. 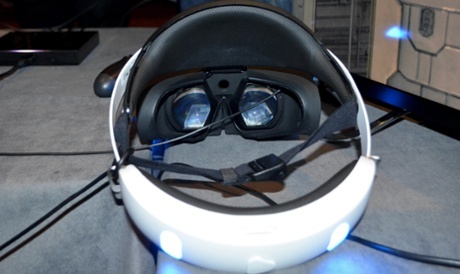 The outside of the Morpheus headset is dotted with lights, which allow the PlayStation camera to track its position and orientation. PS Move controllers and the PS4's DualShock 4 joypad share the same lighting nodules for tracking their position, making the whole thing a one-camera system. There are no two ways about it, the headset is heavy for something strapped to your head, but isn’t uncomfortable to wear. It is something you will notice as you move around, but the single cable is light enough not to cause a drag on your head as you do so. Once inside the headset, the outside world is entirely obscured. The screens are crisp enough that you cannot see any pixelation, even at that minimal distance from your eyes, which combined with the fast refresh rate and 3D audio create a truly immersive experience. Other people in the room with you will be able to see what you see through the headset in 2D on a normal television, which allows social elements to be introduced to what appears on the surface a very solitary gaming experience. Ashforth explained how other players could interact with the virtual world and play other parts of the story concurrently. 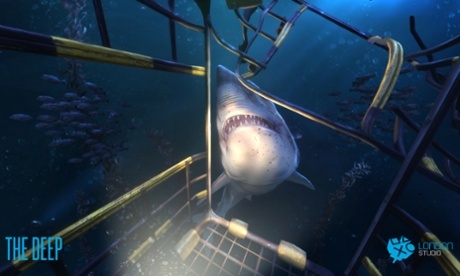 The Deep, one of the demos on offer at a recent PlayStation press event, enables the player to be (virtually) locked in a diving cage and sent into the ocean – less a game and more of an example of a tourist-style experience. At one stage a shark attacks the cage, ripping parts off. 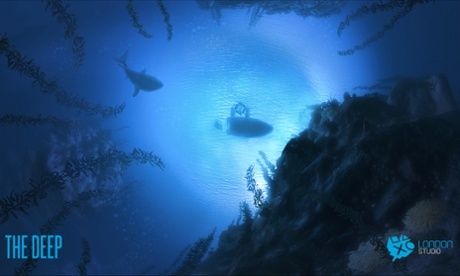 Other players can introduce fish and other events into the depths via second screen apps on tablets and smartphones, while watching what happens on a regular television. The “in player” experience of the Deep is really convincing. You can spin around, see your shoulder, look down and see your flippers, and even see your knees bend as you crouch in real life. The sensory deprivation, flowing underwater sounds and voices over the radio add to the experience, as well as the shock as a shark burst out and attacks your cage. A flare gun is in your hand, controlled by a DualShock 4 controller, which helps to anchor your vision. In fact, I expected my ears to pop and to feel the pressure as the cage sinks. One of the other demos cooked up by internal Sony game developers is The Castle. 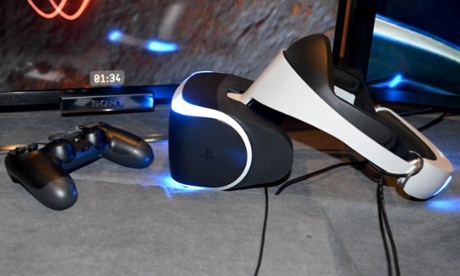 It showed how the Morpheus headset can be used with Sony’s PS Move controllers. Here, two of the controllers become your hands in the game, allowing you to rotate your wrists and grip in a very natural way. The trigger buttons close your fists allowing you to punch a mannequin, much like boxing as part of Wii Sports on the Nintendo Wii, except this time with a more direct connection between your actions and what happens on screen. The experience is convincing enough that it really feels as if the onscreen hands are your own, moving within your vision in precise co-ordination with your real hand movements. The demo then progresses to swords, two of which are stuck in the ground forcing the player to reach over and grab them, pulling them out of the ground and into a fighting position. It all feels very natural and intuitive, holding the trigger button to grip the swords and then swinging them the way you would a real sword. It is perhaps only when you make a connection with the mannequin and don’t feel any resistance as the sword passes through that you suddenly become aware that you aren’t really holding a sword – your brain expects physical resistance. The final stage of the demo gives you a crossbow, which immediately had me shutting one eye to aim down the iron sights. Shutting one eye made no difference at all, of course, but such an instinctive reaction shows how immersive the experience is. At the end of the Castle, a dragon appears, swooping down over the player's head. In my demo, it growled and then ate me, ending the game. The fact that you can hear and then see the dragon take off and then fly over head, turning your vision and looking over your shoulder, adds to the experience dramatically, but also illustrates that it is possible to miss some interactions entirely if you happen not to look in the right direction at the time. Throughout the Castle demo you can walk forwards and backwards to adjust your striking distance for the swords or punches, which to me felt relatively natural, although I was aware that real-world objects like a table lay in my path and there was no way to know whether I was about to hit it. All perception of your real-world surroundings become removed as you place the headset on and are instantly transported to another world. 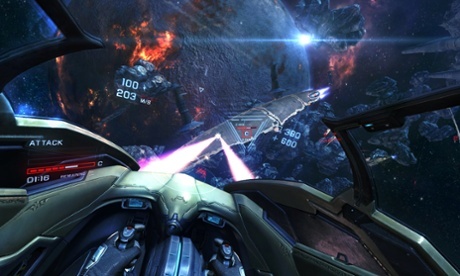 The final demo shown off was space combat game, Eve Valkyrie. Originally designed and programmed with the Oculus Rift in mind, and now taking advantage of the Morpheus headset, it was the only demo on offer that was not produced by Sony and was much more of complete game. As a result, the experience is leagues above the other demos. 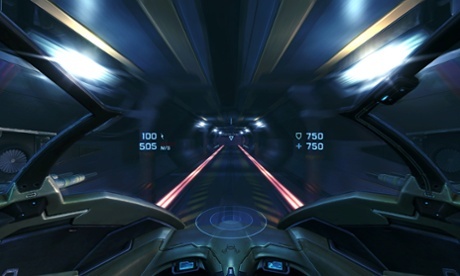 Players are puts inside a star fighter, and the seated-only playing position utterly suits the experience of using the Morpheus. Controlling the ship is pretty much like any 2D space flight game using the DualShock 4 joypad, but it is the fact that you can look all around your ship that makes the empty void of space feel so much more real. With the system tracking your head movements, you can lean to the side and peer down the side of your pilot’s seat inside your cockpit. The team from CCP joked that they should stick a chocolate bar wrapper or two around the cabin to make the experience a bit more authentic. You can lean out and peer over the edges of your cockpit, too, twist your head and view space and ships fly by through the windows, and look up as you pitch your ship, tracking the enemy in your vision. In fact, the experience of putting on the headset they way you would a helmet and being able to see every bit of the inside of the cockpit, including your hands, arms, legs and chest, makes it so immersive that on launch I felt as if my head was being thrown back as the ship rocketed out of the docking bay. In the game, I didn’t feel any motion sickness or nausea until I intentionally pulled a very heavy and fast barrel roll and looked straight into it. At that point, there was a little queasiness, but it would certainly have been the same in a real life in a fighter jet, for instance. It seems that in the coming world of virtual reality entertainment, the most important limits might not be those of the hardware, but those of the player.